32 mainly easy cycling routes exploring the stunning coastal, hill and mountain scenery and history of North wales. 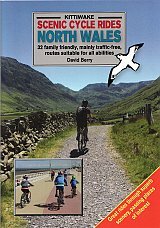 This book incorpporates the wide range of existing designated cycle trails. ride through 3 World Heritage Sites - Conwy and Caernarfon, with their impressive castles, and along the beautiful Llangollen canal with its spectacular Pontcysyllte Aqueduct. Folwo trails close by the Welsh Highland Railway and around Beddgelert and Newborough Forests. Follow the River Dee across the border into the historic Roman city of Chester. Vists Rhudllan and Chirk castles, the two longest piers in Wales and nature reserves.